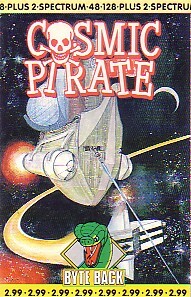 Remarks On the Zee-3 website, Ste Pickford recalls: "We didn't have any involvement in these versions of Cosmic Pirate. Mike Cohen, the studio head of Icon Design / MC Lothlorien was involved with us at Zippo as a business consultant, and to the best of my recollection he negotiated a development contract for 8 bit versions of Cosmic Pirate pretty much behind our back (or perhaps I just wasn't taking much interest in this side of the business). I remember requesting to see half finished versions while they were under development, and being horrified at how bad they were (and to be fair, the original Amiga game wasn't that good in the first place), and hoping that these would never come out."